Thanks for the "A". Can you do the "M" please. Thank you for this beautiful design! This is so darn cute, thank you. Thank You, I love pigs. Thank you for this adorable new alphabet. Will be a favourite with my daughter. Little piggie is so very cute.....thanks so much. Many thanks for such a delightful piggy font. Thanx Miss Veronika!!! These piglets are just the cutest! Thanx again, I can think of lots of things to put them on!!! This is the cutest alphabet yet I can hardly wait to make a kids quilt with them.THank you so much. 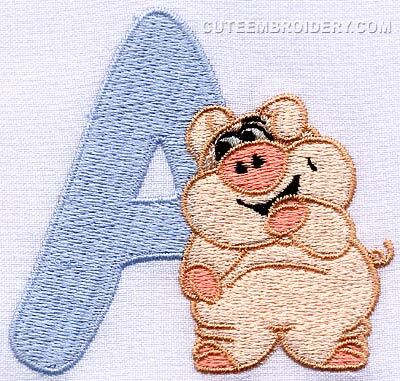 This funny piggy alphabet is adorable; it's really going to be fun to make articles using these darling letters with each different little piggy character. Thank you so much for sharing with us. Thank you for this funny alphabet, it's a great surprise to see this cute font! Thanks you, for all desings. Merci pour tout vos motifs. THank you so much! This one is very very cute!! Thank you for the cute piggy designs. Can't wait to make something cute for my pig loving sister - Hehehe! Thank you very much Ms. Veronika for this adoreable alphabet. I know many people who live on farms, so this will certainly be put to good use. Thank you again for your generosity. Thank you for this piggy font - delightful! OMG this is oh sooooo CUTE ... thanks sooo much! Thank you. This is a cute one. thanks for this adorable alpha! my niece is a veterinarian and raised pigs all through high school for 4H. THIS has her name on it! I love the little pigs, Thank you another beautiful font. Cute manages to do it again! Another "Cute" alphabet. Thank you so much. I have just the person to use this for. Bana üyeliğimi hatırlattığı için site yönetimine çok teşekkür ederim.Ayrıca tasarımlarda çok güzel. I Thank You these are cute and as I chuckled this could make many diet signs for reminding me to think thin. Dankje erg lief om te borduren. Another font to touch our heart, lovely little piggy wiggy...thanks Veronika. Thank you. Very fun. I appreciate. THANK YOU, ANOTHER EXCITING SET TO GO AFTER!!! They are gorgeous, thank you sooooo much!! Thank you so much for this beautiful design. A great set for the piggy designs. Hopefully we will get a pack for the font.